For several weeks, I've noticed the "Summer Bucket List" idea floating around the blogging world. Originally, I didn't plan to participate. We don't have anything like the end of the school year to signify the beginning of summer. We have an infant and a toddler in our home, so a lot of the typical bucket list ideas just don't work for us right now. We can't take a cross-country road-trip, make elaborate craft projects, or go to outdoor movies in the park. We could do things like go hiking, camping, or go to a baseball game - but those really aren't our cup of tea in the first place, so doing them with our munchkins in tow is unlikely to be an adventure we will enjoy. Andrew and I brainstormed this weekend, though, and came to the conclusion that our family can still enjoy a fun-filled summer, even if we can't do everything families with older kids can. So, here's our Summer Bucket List of things to do with a baby and a toddler! Some of them are Kansas City specific, since that's where we are located. I'll be updating the list with links about our adventures as we complete them! -Eat at T-Rex Cafe. Done! -Watch (maybe catch?) lightning bugs. -Ride the carousel and train at the KC Zoo. Done! -Spray paint a clock in the backyard. Use pool noodles for hands. Lincoln is crazy obsessed with clocks right now! -Visit the City Market. Done! -Train ride at Day Out With Thomas. Done! -Go to Downtown Days (local summer festival). Done! -Visit Deanna Rose Children's Farmstead. Done! -Complete the Summer Reading Program at the library. Done! -Draw with sidewalk chalk. Done! -Walk to Sonic for ice cream. Done! -Eat at Fritz's KC. Done! -Visit every park in our town (there are 27!). -Play in the sprinkler. Done! -Eat dinner on the deck. Whew! I'm a little bit exhausted just thinking about all this fun. Will we accomplish everything on the list? Maybe not. But the memories we make will be well worth the effort! I'm linking up with a couple of inspiring summer bucket list bloggers - The Happy Family Movement and Little Wonders' Days! 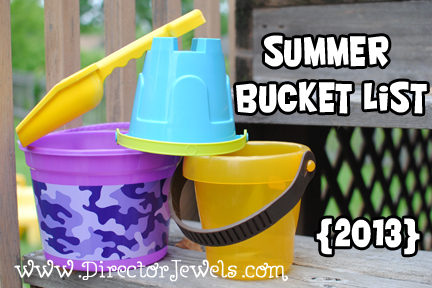 Pop over and check out all the fun ideas if you're looking to fill up your own bucket list! What's your favorite summertime activity for an infant and/or toddler family? I would love to hear! what an amazing list! I love it! I love that bucket list. I had a winter bucket list and never made it through half of it. Funny how there never seems to be enough time. Of course the blizzard and hurricane had a bit to do with it. Such fun ideas! I was talking to a mom at the park the other day about all of the summer ideas we have from pinterest and how many we will actually do! I really plan on spending my days at the beach or pool! Sweet and simple! Love the concept of a summer bucket list! Seems like you have no shortage of fun in store for you! I am off to copying your idea, thanks! I should make a list too :D but thanks for sharing this though will keep this in mind. That's a great bucket list! My kids and I are going to do that too!